We look forward to seeing everyone at the 30th Anniversary Festival of Trees at Apple Mountain, 4519 N River Rd, Freeland, MI! Fri., Nov. 9, 10 a.m. - 5 p.m., Premiere Night 6 p.m. - 10 p.m. Sat., Nov. 10, 10 a.m. - 7 p.m. Sun., Nov. 11, 10 a.m. - 4 p.m., Raffle starts at 4 p.m.
FREE admission all weekend to ALL Veterans with presentation of military ID in honor of Veteran's Day. The money raised throughout the weekend supports the Junior League of the Great Lakes Bay Region's mission of promoting voluntarism, training its members, and improving the community. Over 100 designers will be contributing fabulously decorated trees and wreaths to be raffled off to lucky winners. We have local vendors who will be selling their specialties. New this year, we will be selling a 30th anniversary commemorate keepsake ornament, pictured below, for $10.00. This special edition ornament will be available for purchase at the Junior League table inside the ballroom. Supplies are limited and will be sold on a first come first serve basis. 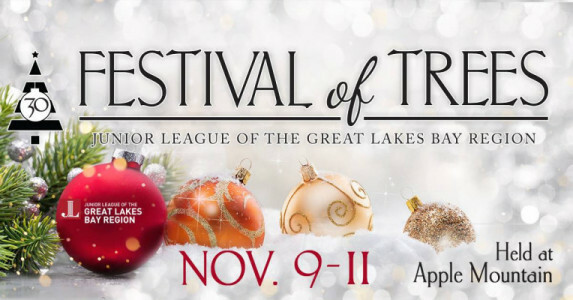 The Junior League of the Great Lakes Bay Region wishes to thank everyone who is gearing up to make this year's Festival another great success. Because of your support, the League is able to continue helping those in the Great Lakes Bay Region! Tickets for Premiere Night may be purchased in advance on our website. As of Oct 22nd, tickets for Premiere Night 2018 have sold out! Questions or interest in the 2018 event can be sent to hq@jlgreatlakesbay.org.